With the CTK-4400, enjoy musical fun with a compact keyboard, making every performance a unique experience. The built-in Hall effect button allows you to do this in an impressive way: At the touch of a button, concert hall reverb can be applied to the sound of the keyboard, adding authenticity when you play. 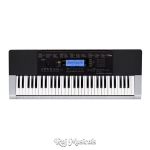 The keyboard also has 61 dynamic touch keys, 180 lively rhythms and 152 songs, as well as 32 registration memories allowing you to store settings such as tempo, tones or rhythms easily.